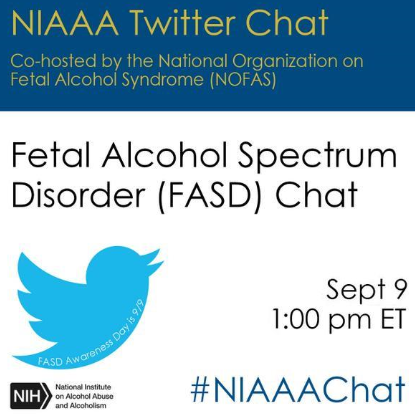 Alcohol use during pregnancy can cause a range of lifelong physical, behavioral, and intellectual disabilities known as fetal alcohol spectrum disorders (FASDs). Alcohol use during pregnancy can also cause miscarriage, stillbirth, prematurity, and sudden infant death syndrome. During pregnancy, there is no known safe amount of alcohol use as well as no safe time and no safe type of alcohol to drink. Each year, the ninth day of the ninth month (September 9) marks FASD Awareness Day. This day was chosen to commemorate the 9 months of pregnancy and to serve as a reminder that the best advice is to avoid any alcohol use during pregnancy. The first awareness day was recognized on 9/9/1999. CDC is working with FASD Practice and Implementation Centers and national partners to promote systems-level practice changes among providers through training and implementation of evidence-based approaches in the prevention, identification, and management of FASDs. Healthcare professionals can use alcohol screening and brief counseling to help people who are drinking too much to reduce their alcohol use and advise women not to drink at all if there is any chance they could be pregnant. Use the FASD Awareness Day Packet for 2015 to promote consistent messaging about the risks of alcohol use during pregnancy and the effects of FASDs. The packet includes social media messages designed to be used widely. Please share our CDC.gov Web feature with colleagues and partners – Living with FASDs: In Taylor’s Own Words. The feature tells the story of a young man, Taylor Allen, his FASD journey, and how he became empowered to tell his story and educate others. The feature also highlights two new fact sheets available from CDC. Thank you to the Allen family and the National Organization on Fetal Alcohol Syndrome (NOFAS) for sharing their story! FASDs are completely preventable if a woman does not drink alcohol during pregnancy. More information about FASDs and alcohol use during pregnancy is available at www.cdc.gov/fasd. This webinar included a panel presentation and moderated discussion on the launch, what it means to you and how to be ready to help. Members of the Friends of NCBDDD who have been closely following the implementation of the Affordable Care Act (ACA) answered some of the most frequently asked questions regarding Insurance Marketplaces and their impact on coverage and access to care for people with disabilities. 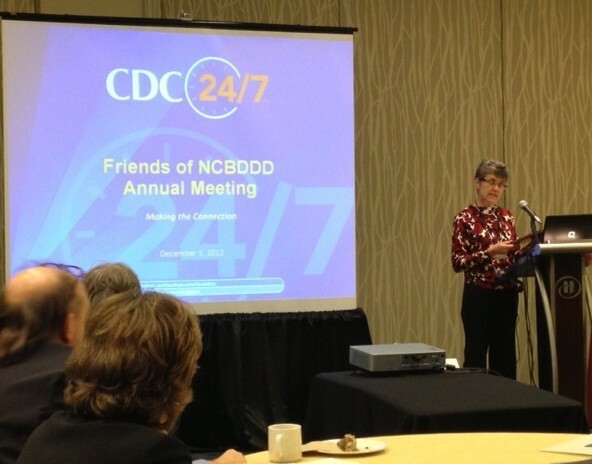 The Friends of NCBDDD Advocacy Coalition is a collaboration of 25 organizations that support the extraordinary work of the Center for Disease Control and Prevention’s (CDC’s) National Center on Birth Defects and Developmental Disabilities (NCBDDD). We urge Congress and the Administration to maintain the integrity of the NCBDDD during these challenging budget times by providing level funding of $145.524 million in Fiscal Year 2014. Ensuring stable, adequate funding and maintaining the current structure and programmatic focus represents a sound public investment that will continue to prevent birth defects and developmental disabilities and help people with disabilities and blood disorders live the healthiest life possible. Click here to read more! NCBDDD announced the appointment of two leadership positions in the Office of the Director, NCBDDD. Stephanie Dulin has been hired as the Center’s Deputy Director and Dr. Stuart Shapira has been hired as the Center’s Medical Officer and Associate Director of Science. Most recently, Stephanie served a 6-month detail as the acting Deputy Director for the NCBDDD. Prior to joining NCBDDD on detail, Stephanie was the chief of the Community Resilience Activity Team, Office of the Director, Division of Strategic National Stockpile (DSNS), Office of Public Health Preparedness and Response, Centers for Disease Control and Prevention (CDC). In total, she has 25 years of public health programming experience at the local, state and federal levels of government. Stephanie was the DSNS Program Preparedness Branch (PPB) chief from 2006-2012. In this capacity, she managed 50 staff and an annual budget of $10 million. Under her supervision, the branch was responsible for the development of guidance, tools and the provision of Strategic National Stockpile technical assistance to the 62 Public Health Emergency Preparedness (PHEP) Cooperative Agreement-funded awardees and more than 450 counties participating in the Cities Readiness Initiative. Stephanie originally joined PPB in 2002 where she first served as a program services consultant and then as a team lead prior to being named branch chief. Stephanie’s other CDC experience includes serving as a public health advisor assigned to the Arizona Department of Health Services’ Breast and Cervical Cancer Early Detection Program. In addition to supporting the state’s Well Woman Healthcheck program, Stephanie championed disability awareness among the National Breast and Cervical Early Detection Program as the lead of the Women with Disabilities working group. Stephanie initially joined CDC in 1991 as a public health advisor with the CDC’s National Center for Prevention Services, Division of STD/HIV Prevention, Program Operations Branch as a sexually transmitted disease intervention specialist. From 1995 to 1998, she held various positions with the State of Florida, Department of Health, Bureau of HIV/AIDS. Earlier, Stephanie also served as project director of the University of Texas Southwestern Medical School, Department of OB/GYN, Division of Maternal Health and Family Planning, Serving Pregnant Parenting Adolescent Needs Project. Stephanie holds a Bachelor of Science degree in rehabilitation sciences and a Master of Business Administration degree in health care management. Since 2005, Stuart served initially as a Senior Service Fellow and currently as a Medical Officer on the Pediatric Genetics Team in the Division of Birth Defects and Developmental Disabilities. In 2010 he served a 6-month detail as Acting Associate Director for Science for the National Center on Birth Defects and Developmental Disabilities. Stuart received his PhD degree in Genetics and his MD degree from the University of Chicago. He completed a residency in Pediatrics and a clinical fellowship in Genetics & Metabolism at Boston Children’s Hospital. He also completed dual research fellowships in Genetics & Metabolism and in Allergy & Immunology at Harvard Medical School. Stuart is board-certified in Clinical Genetics, Biochemical Genetics, and Molecular Genetics. Stuart practiced clinical and metabolic genetics at Baylor College of Medicine in Houston and at the University of Texas Health Science Center in San Antonio, before joining NCBDDD. He serves as chairman of the Clinicians Committee for the National Birth Defects Prevention Study and chairman of the Dysmorphology Workgroup for the Centers for Autism and Developmental Disabilities Research and Epidemiology. He also serves as a Division spokesperson for Center and Division priorities and scientific findings; a metabolic disorders/mitochondrial disease expert for the Clinical Immunization Safety Assessment Network; CDC liaison to the Committee on Genetics for the American Academy of Pediatrics; and member of the Editorial Board for the American Journal of Medical Genetics. Stuart’s research activities include birth defects epidemiology, dysmorphology of autism, gene and nutritional interactions for adverse reproductive outcomes, and newborn screening. He has authored and coauthored more than 100 articles, book chapters, and abstracts, and he has been an invited speaker at numerous regional, national, and international scientific conferences. 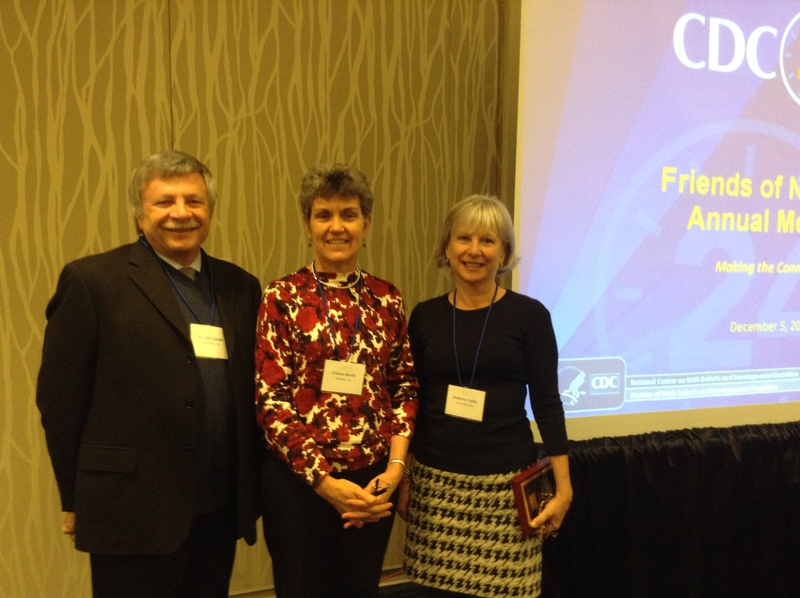 The Friends of NCBDDD met at an in person meeting on December 5, 2012, in Washington, DC. The theme of the meeting was, “Making Connections.” Key successes, focus areas, and updates were provided by Dr. Coleen Boyle, Director, National Center on Birth Defects and Developmental Disabilities; Dr. Cynthia Moore, Director, Division of Birth Defects and Developmental Disabilities; Dr. Gloria Krahn, Director, Division of Human Development and Disability; and Dr. Christopher Parker, Deputy Directory, Division of Blood Disorders. The Friends also had an opportunity to ask questions and connect with Dr. Boyle and her leadership team. Click here to to view Dr. Boyle’s PowerPoint slides and click here to view minutes from the meeting. The December 5th meeting was also a time to recognize outgoing Friends Executive Committee members and introduce incoming officers. Outgoing members include Roberta Carlin, Chair; Joseph Canose, Vice Chair; Adriane Griffen, Member and Communication Chair; Eileen Ouellette, Member at Large; and Patricia Wright, Member at Large. New members of the Executive Committee will be Adriane Griffen, Chair; Craig Mason, Vice Chair; Judit Ungar/Jeff Cohen, Membership/Communications Chair; Carolyn Mullen, Mary Andrus, Cindy Brownstein, Members at Large; Emil Wigode, Advocacy Coalition; and Roberta Carlin, Past Chair. * What do you like? What would you change? * Have we adequately captured our achievements, successes, and dealings in the community? * Does it represent NCBDDD well in a clear and accurate way? * Does it adequately show how funds are put to work? * Do the listed activities and programs explain how they have helped to achieve our priorities? * Does the web format make sense and does it help you in your efforts to promote the issues? * How often would you like to see NCBDDD publish its report? * For what purpose have you used NCBDDD’s annual report in the past? The annual report is a tool for all who want to address the issues of people living with disabilities, birth defects, and blood disorders, so it’s important to make it something that can work for everyone in their efforts to have an impact. Please give the site a look: http://www.cdc.gov/ncbddd/AboutUs/2011annualreport.html.